Bristol Airport is a large regional airport serving the south-west of England, handling approximately 6 million passengers per year. It has one runway of 2000m long, running 09/27 and a simple airfield layout running parallel to the runway. It is surrounded by Class D airspace, providing connectivity to the airways structure, and has a full set of SIDs and STARs. Large commercial passenger jets on scheduled services operate alongside general aviation light aeroplanes at Bristol. For this reason, the apron north of the runway is a secured compound, and general aviation should operate from the south of the runway ONLY. All aircraft at Bristol - including general aviation on the south side of the runway - are required to call for engine-start clearance. 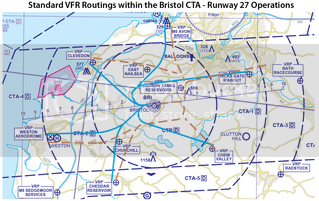 Bristol has a number of published Standard Arrival Routes (STARs), which all terminate at the BRI NDB where holding will take place if necessary. IFR departures from the south/west/north should expect to be initially handled by Cardiff Radar in the descent and subsequently transferred to Bristol Radar once at a lower level, this is due to the airspace structure in the vicinity of BCN/EXMOR. Please observe the published Speed Limit Points (SLPs) on the arrival. VFR Flights should plan to depart the CTR via one of the published VRPs. Expect a clearance to exit the zone not above altitude 2000ft, however this may vary depending on the situation. You will be issued with the Bristol VFR Conspicuity code 5070, unless the situation dictates otherwise. Initial call should be made on the radar frequency, if online, approximately 10 minutes from the zone boundary. Clearance to enter the zone is usually issued by the aerodrome controller on 133.850 MHz. Expect to enter the zone not above altitude 2000ft, routing via a VRP for a left/right downwind/base join for the runway in use. Depending on traffic, delaying action may be necessary for sequencing. All visual circuits are conducted to the south of the airfield, unless otherwise authorised. Circuits should be flown at a height of 1000ft QFE for fixed wing aircraft or 700ft QFE for rotary wing traffic. Aircraft entering the visual circuit should select transponder code 7010 Mode C for ACAS purposes.